Roseville Princess Party Performer Sarah services the Roseville, CA area and surrounding areas of the Sacramento Region. 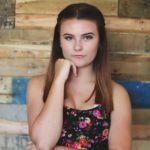 Sarah E. is a senior at Rocklin High School, who plans to pursue theatre throughout college. She has participated in 13 musicals/performances with local theaters as well as with her school, and has loved every minute. She lives in Rocklin, California and when she’s not at school or work, she can be found on stage, singing and dancing, volunteering at the local animal shelter and spending time with friends. She has always loved Princesses and performing, even when she was just 1 year old she would dress up as princesses and force her mom to record her. She plans to dedicate her life to performing and participates in many singing, dancing, and acting classes in school. She is overjoyed to be apart of Amazing Fairytale Parties, as it seems to be a dream come true! She wants to bring the same joy to young kids that princesses brought/bring to her. To book Roseville Princess Party Performer Sarah E. Call us at 916-246-9980 or fill out our inquiry form to check availability!